Historians at The Autry Museum of the American West recently discovered an entry in a diary that belonged to one of the members of infamous Donner Party that resorted to cannibalism in order to survive, while migrating to California in 1846-47 . The controversial passage which was written in the diary was torn out, that left historians wondering what the entry was all about. And why was it torn out. While diagonally scanning the diary, historians found that although the page was ripped out of the personal journal that they could still reconstruct what was originally written in it. “The pressure from the pencil left an imprint of what was written on the opposite page,” said a historian. All these years, Western historians had been speculating not only what could be the entry in a diary that documented the doomed Donner Party's' decent into cannibalism. But that it must have been so horrific that, the author felt compelled to tear it out as well. "And we were right,” said a historian. The following entry was extracted from the Donner Party diary, which historians were able to reconstruct during the technically complicated process of digital replication. 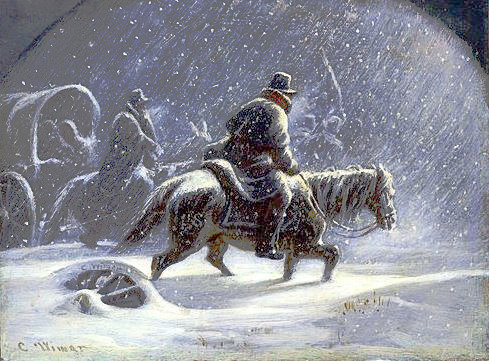 Although all the historians agree the Donner Party knock knock joke is offensive, some even going so far as to calling it “truly tasteless”, one historian defended the entry. “Clearly the Donner Party knock knock joke was intended to uplift spirits [of the survivors],” said the dissenting historian. However, given when the joke was written, while the cannibalism was still going on.